An integral part of Rosewood’s continuum of care is our Aftercare and Alumni Programs, which are designed to provide clients with strong support systems as they return home. 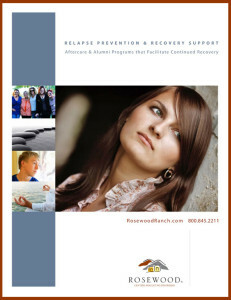 For more information about Aftercare and Alumni programs, please download our 32 page ebook, RELAPSE PREVENTION & RECOVERY SUPPORT Aftercare & Alumni Programs that Facilitate Continued Recovery. In this colorful, engaging book you will also have the opportunity to read testimonials from the many men, women, and adolescents who have found recovery at Rosewood. We hope that these success stories will inspire those in need to seek the help they require. Please share this document freely.